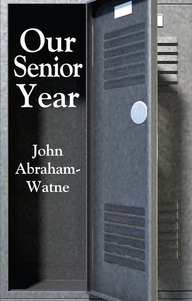 Our Senior Year is the debut novel from John Abraham-Watne. The book deals with high school, "quarter-life crisis," friendship, religion, love, and all the major themes people go through during those years. Minneapolis writer Jason Wareheim never expected to go back to his ten-year high school reunion, but what he found back in his hometown changed the way he saw everything. The journal left behind by his best friend Jack Wayne brings back all the memories of their senior year, inspiring Jason to finally tell the story of "the three musketeers" and their lives in the small town of Clarmont, Iowa. Theirs was a story crossed by love, tragedy, friendship, loyalty, and simple cruising on gravel roads. This is a story of high school. It is available in many fine book stores around the Twin Cities - including Magers & Quinn and Boneshaker Books in Minneapolis, and the Red Balloon Bookshop in St. Paul. You can also pick it up through Amazon or Barnes & Noble. Here is an essay John wrote for David Abrams' site The Quivering Pen that explains some of the thinking and history behind the book. "I've never related to a book as much as I did with this story. 'Our Senior Year' brought back so many memories of my own high school experience from drama with friends, school dances, cruising around town and the everyday thoughts of a normal teenager." "This moving book is written with keen insight into the mind and experience of a young person growing up very quickly, perhaps more quickly than he thought possible." "I was taken back to a time and place that felt familiar. The author created vivid characters, that I cared about." "This is an entertaining story! It is an examination of the events that shaped your life." Available at Magers & Quinn Booksellers and Boneshaker Books in Minneapolis, Valley Bookseller in Stillwater MN, It is also available via Amazon or Barnes & Noble. Last Man on Campus is the second novel by John Abraham-Watne. A supernatural thriller set on a tiny college campus in northwest Minnesota, this is his love letter to Stephen King, an author that has had a profound effect on him over the years. "'Last Man on Campus' is an original and deftly crafted read that clearly showcases author John Abraham-Watne as an exceptionally gifted storyteller who will leave his fully entertained readers looking eagerly toward his next novel." Here is an essay John wrote for the Indie Beginning blog about books and bookstores.